This month is all about showing off the different spaces in our newly renovated house, which is super fun for me, and I hope you enjoy coming along for the ride too! It's been awesome for us to start seeing everything really come together around here. We painted the entire house ourselves (both exterior and interior) ourselves, and are still going with the painting in quite a few different areas around the home. This teamed with other tasks we still have to complete, such as building a laundry, landscaping the garden and creating a new command centre, has really made this whole project feel like a massive labour of love! But it's also something that we're both incredibly proud of, and I think it's great for our kids to see how much hard work we're putting in to create our dream home. Now that we're back home, they get to help out too which is a lot more fun. Thus far I've given you a sneak peek at our kitchen and the kids' finished bedrooms. 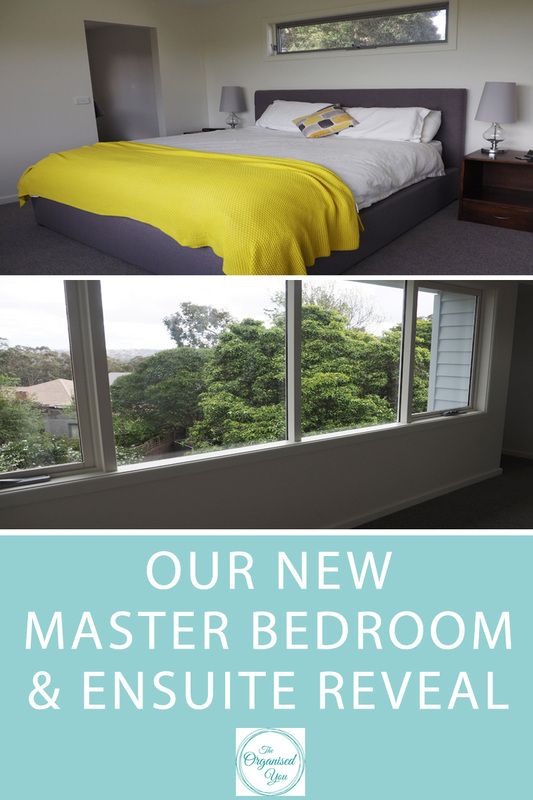 Today I'm excited to be showing you our master bedroom and ensuite. Let's look around! This upstairs space was one of the major parts of our renovation. We knocked out walls and extended the living area, and then above the new extension we created this 'adult retreat'. Which sounds a lot more mysterious than it is because, you know, it's really just a room to escape to when we need a break from the kids! They usually follow us up anyhow haha. The view as you come to the top of the stairs is incredible, with a series of windows showing off the treetops and the city in the distance. 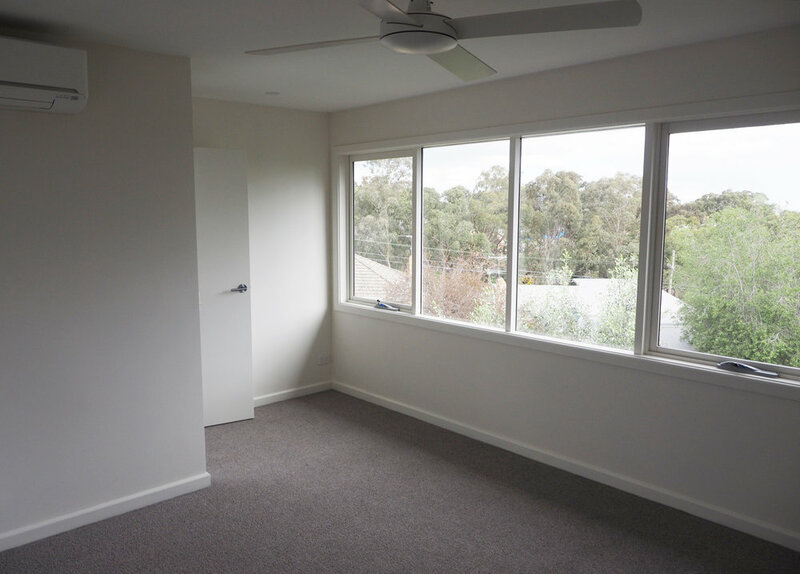 Here are some pictures of what the room looked like before we brought in our furniture so you can get a good idea of the space - it's always tricky to try and capture in photos. 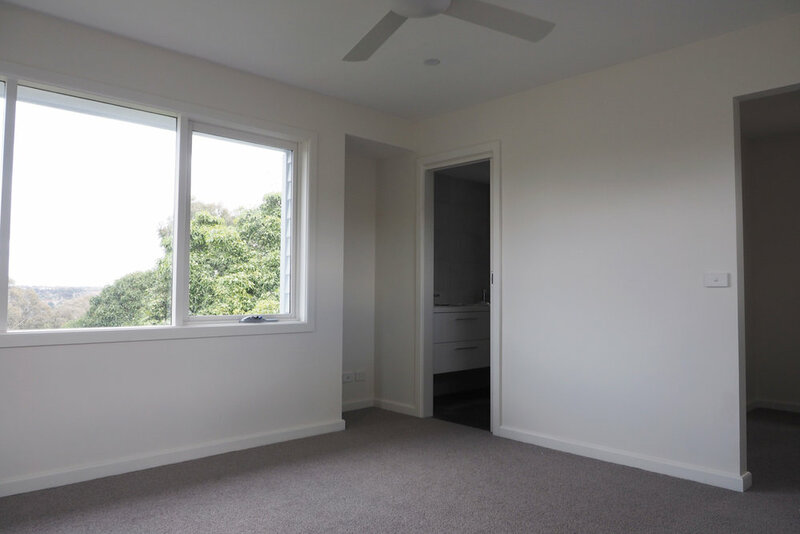 To the left in this photo is the ensuite and to the right is the walk-in wardrobe. And this is the view from the bed. Pretty sweet! 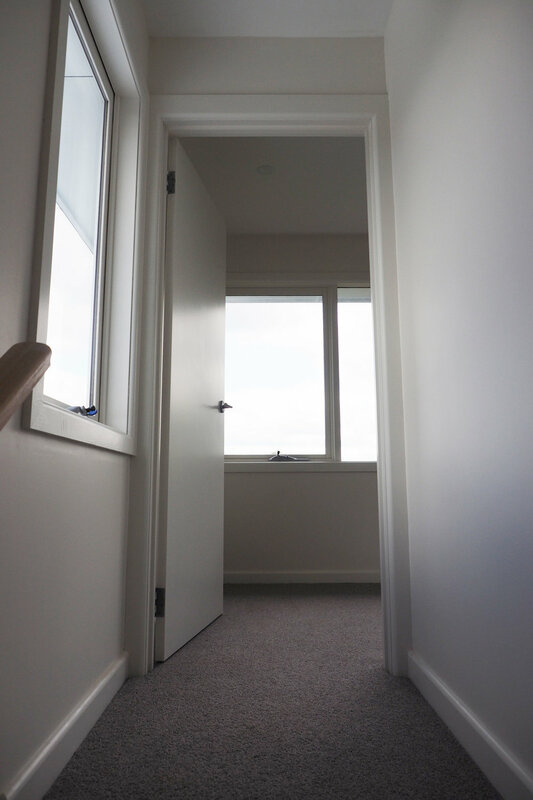 We chose some pretty luxurious carpet for this space, and it ties in nicely with the light floor-boards coming up the stairs, and the dark grey of the ensuite tile. It was a splurge, but I'm glad we went for it. We put our bed right in the centre of the room with the bedside tables at either side. We were initially a little worried there wasn't going to be enough room up here, but it feels really spacious and there's plenty of room either side of the bed. I really missed my bed while we were out of the house the last 6 months. There really is nothing like sleeping in your own bed, right? You might remember from my master bedroom reveal last year that this bed actually lifts up for hidden storage in the base. It was filled with all our old baby stuff - cot, change-table, books etc - that we've cleared and will be passing onto a friend who is pregnant. More decluttering for the win! Now it's just got a spare blanket and spare sheet sets, but I'm sure we'll fill it with other things over time. It's good to know we have that extra storage space. To the right of the bed will be the walk-in wardrobe. This is one area we're desperate to get a move on, as our clothes are still downstairs in our old walk-in robe, and it's a bit of a pain not having everything accessible. We have brought up our old chest of drawers, so just need to figure out how we're going to configure this little space to fit everything in. My vision is loads of hanging space and maybe some open shelving for shoes. I'll show you the updates on The Organised You TV when we get to it! In this little nook to the left of the bathroom, we're planning on some open wooden shelving for books and knick-knacks, and perhaps a storage cabinet. It'll be nice to bring some decorative elements into this space, such as artwork or photos, as it's a pretty blank slate at this stage. And here is our ensuite! Neither of us have ever had an ensuite before, so this space is a pretty amazing new experience for us! We wanted the bathroom to feel luxurious, so we went with some gorgeous Italian tiles and tiled from floor to ceiling as it's such a small space. We'll be getting a long rectangular mirror to go across this wall, but not too big as it would be a shame to cover up these beautiful tiles! The shower is really spacious - it's pretty awesome to be able to turn the water on and not get scalded as it heats up! 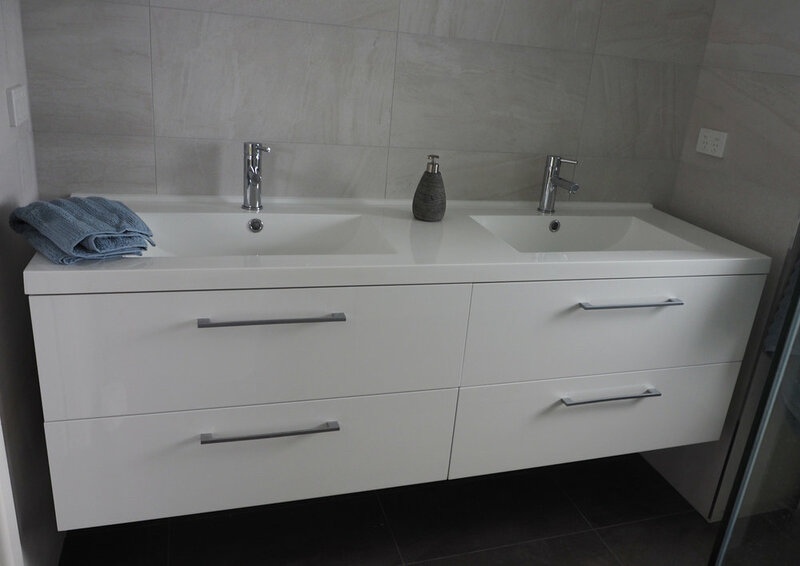 The double vanity has been a fantastic addition - my husband was insistent on it from the start, and I was always a bit put off because it was one extra sink to clean. But both being able to stand at the sink and get ready in the morning, and have so much storage space with these deep drawers, is pretty great. All in all, I just love this bathroom and am really thrilled we managed to make it work in this space. So that concludes the master bedroom tour - hope you enjoyed it :) I sure am loving this new space and feeling so grateful every time I walk up those stairs - it still feels a bit surreal. 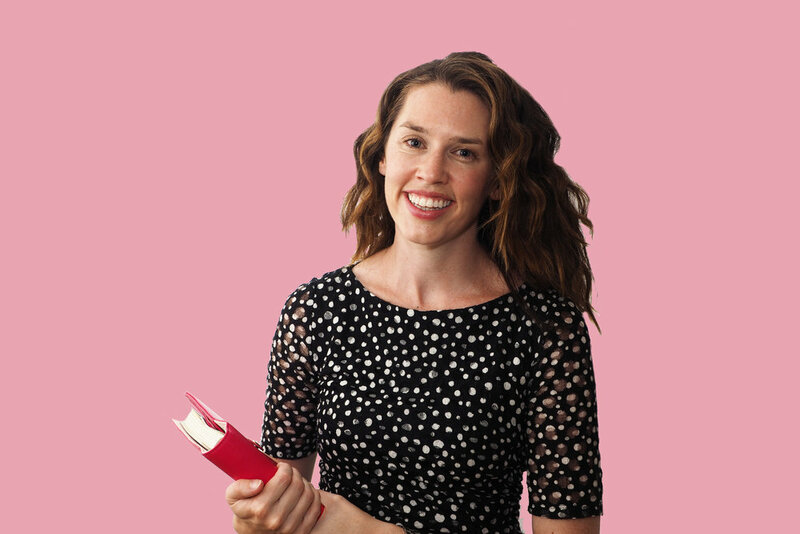 If you've got any questions about this space, please let me know in the comments below! 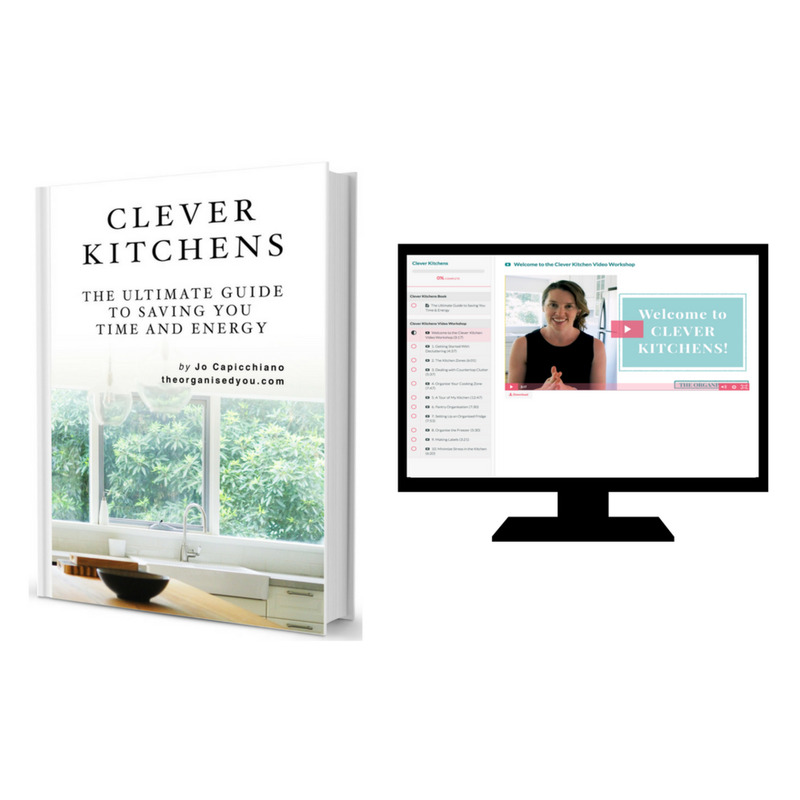 I'll be sure to show you how I set up the walk-in robe and organise the bathroom vanity over the next month so stay tuned!